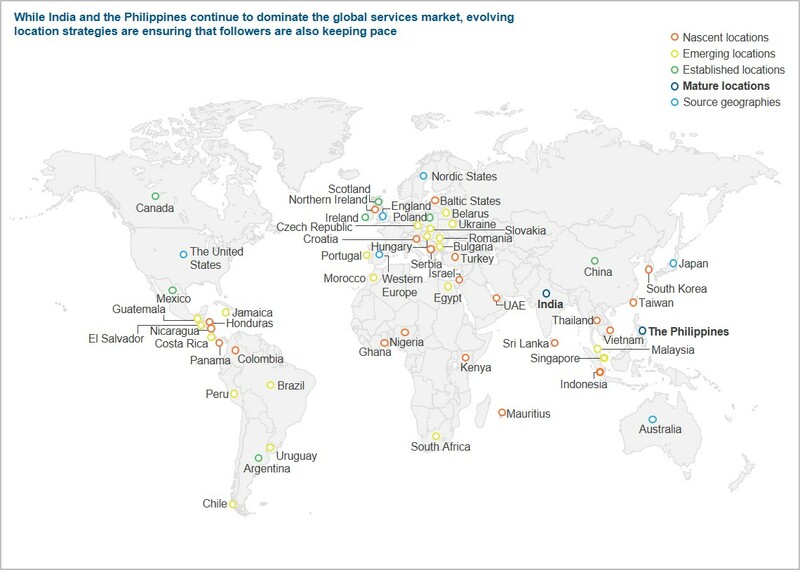 The global services landscape is at the tipping point of transformation. There are many changes that are taking place from a macroeconomic and legal perspective in key onshore/source locations. While these may influence the market in the long run, their impact at present is uncertain. The global services market is manifesting this uncertainty in terms of muted growth in revenue, talent pool, and center set-up activity. There are also shifts in the traditional services delivery landscape. While Asia Pacific continues to dominate this space, Nearshore Europe also witnessed significant growth, particularly for digital services. It would also come as no surprise that reshoring continues to be a prominent trend as protectionism rises. The Global Locations Annual Report 2018 takes a stance in describing the nuances of the global services locations landscape, interpreting locations-related developments and trends for designing locations portfolio strategy. It presents insights into the size and growth of this market, global services exports by region & country, update of locations activity by region & country, and trends affecting global locations (changes in investment environment, key developments across the world, and changes in exposure to various risks). It also provides industry-leading comparison and analysis of key changes in maturity, arbitrage, stability, and potential of global delivery locations (cities) through our unique PEAK Matrix™.